PENSACOLA, Fla. – Kyle Busch returned to his short track roots on Sunday afternoon at Five Flags Speedway and put a bow on his 2017 season by scoring one of the biggest victories of his career. Busch pounced late to win the 50th annual Snowball Derby, passing Florida veteran Jeff Choquette with 17 to go in the 300-lap super late model crown jewel and pulling away to a 2.153 second victory at the twin checkers. 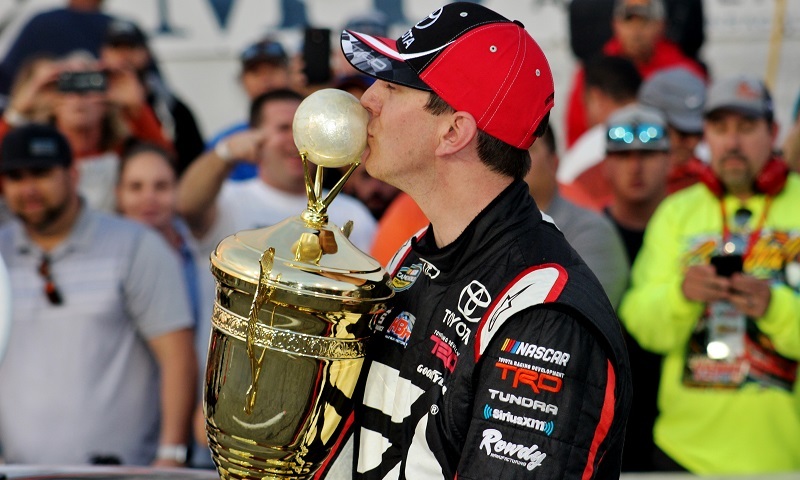 Sunday marked Busch’s second time hoisting the famed Tom Dawson Trophy, after previously winning the Snowball Derby in 2009. Unlike that day, in which Busch led three times for a race-high 91 laps, the final stretch of the golden anniversary Derby was the only time that the No. 51 Phoenix Construction Toyota was out front all day. That didn’t matter to Busch, though. What mattered was the kiss he got to plant on the golden snowball atop the trophy, the $25,000 check he earned and the significance of triumphing again in one of short track racing’s premier events. In stark contrast to how the closing stages of the Derby have played out in recent years, the final 66 laps of this year’s race ran uninterrupted, allowing Busch to capitalize on the stellar long run pace of his car. Choquette came home as the runner-up for the second time in his Derby career, tying his career-best set back in 2012 – appropriately, the last time before Sunday that Busch had competed in the event.